Corrosion is not only due to the make-up of the well fluid and adverse flow conditions but also due to the toxic chemical used during well treatment. Wells can have more than 30000 PPM of H2S. Deep well contains Carbon dioxide, Hydrogen sulfide and other corrosive fluids. 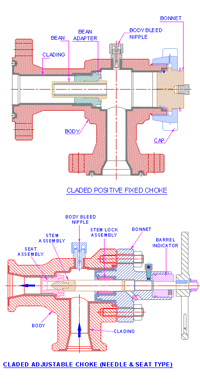 JVS offers Clad Choke’s/Valve’s in order to counteract the above flow conditions. The cladding process ensures the best output to maintain corrosion resistance imparted by the exotic nickel alloys and simultaneously maintaining the cost effectiveness of the overall project. JVS offers clad choke valve to fulfill Oil and gas project requirements with competitive pricing and dependable delivery. Cladding or weld overlay of wetted surfaces of choke valves using Corrosion Resistant Alloys (CRAs) is a standard practice for ensuring fitness for purpose while still keeping costs manageable. JVS Engineers is capable of cladding diverse products /geometries with different alloys to match stringent customer specifications over and above API 6A and NACE MR 0175 requirements. Comprehensive documentation package includes material certificates, WPSs, PWHT charts, NDT reports etc. verified by in-house AWS Certified Welding Inspector and ASNT Level II and Level III personnel. Cladding of Alloy 625 meets API 6A Fe5 class at thickness of 3.2mm(1/8") but more economical Fe10 class cladding can also be provided at that thickness. Lean organization ensures faster response and better economy in meeting your needs. Carbon and Low alloy steels in ASTM and AISI cast and forged grades. Martensitic Stainless Steels such as 410.